I have always dreamed of owning a home with a lovely big indoor swimming pool (because British weather is too unpredictable to have an outdoor pool), and although it may not be a reality at present, it is not an impossible dream! I recently found out that Anglian can build conservatories or orangeries that are suitable to house a swimming pool! Although we don’t install the swimming pool itself, we can add a beautiful room for you to swim lengths, relax and have some watery fun inside. Do you want a pool that sits above ground level or below ground level? Will you have a pool cover for when it is not in use? These can help with controlling the humidity of the room and retaining the temperature of the water. Can the flooring beneath handle the weight of the pool? 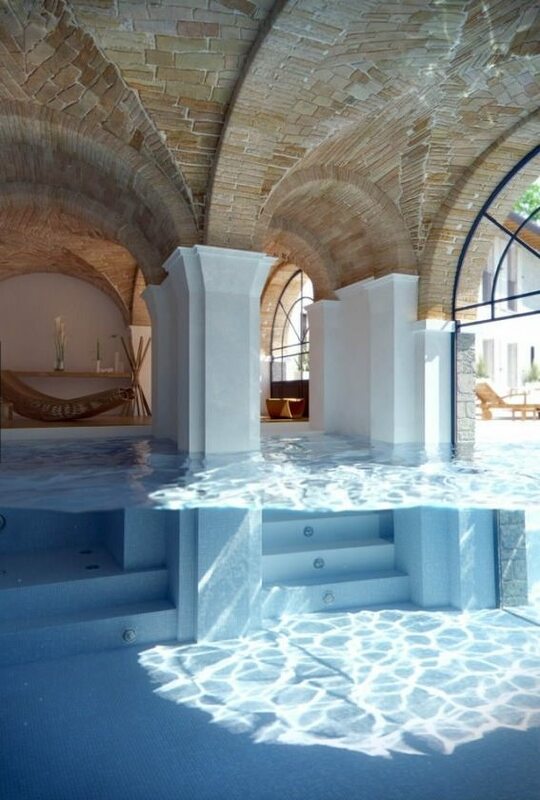 So, to give you some inspiration, I have been scouring the internet for some indoor swimming pool sensations. 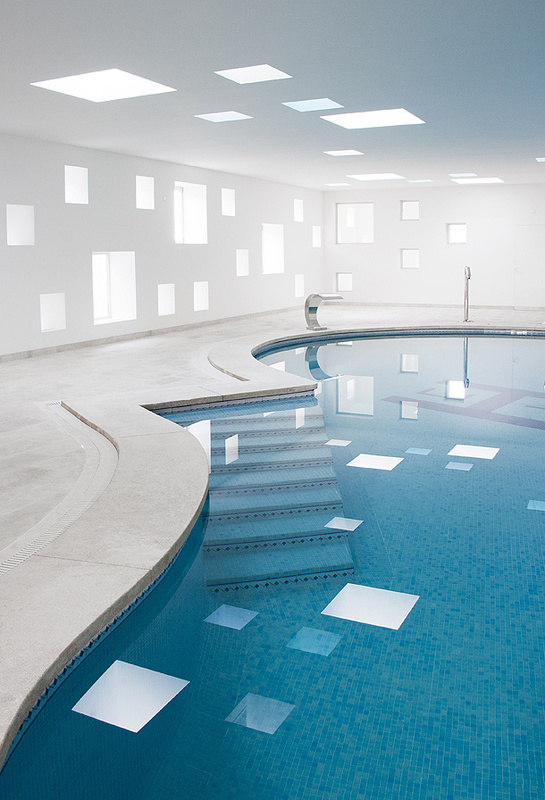 We love this Spanish swimming pools use of square windows and skylights in different sizes. Although the white is a bit clinical, it makes it a brilliantly bright room. Now, we may not be able to build something as extravagant and unique as this, but this swimming room is truly amazing! 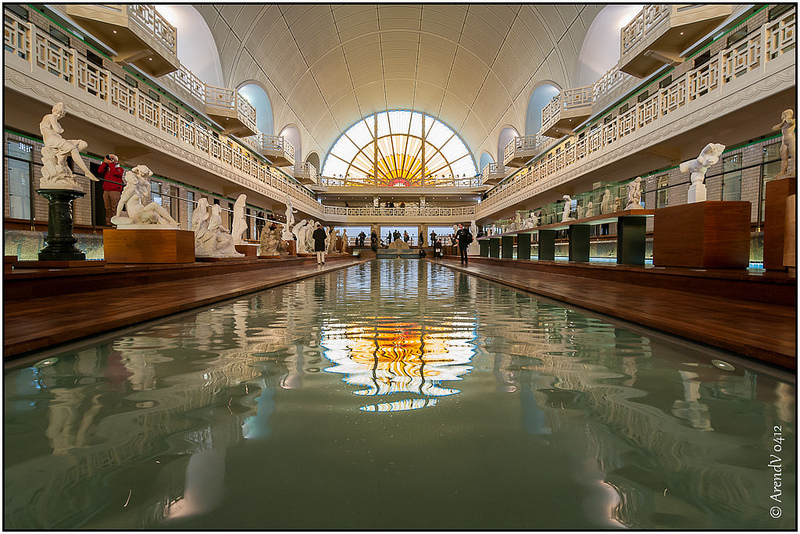 This is the Roubaix La Piscine in France, which used to be an indoor pool, but now is a museum. Gorgeous coloured glazing creates a great reflection in the pool. How are they doing that?!?! 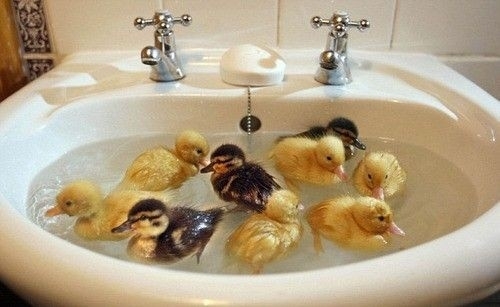 Well, actually it is not a real swimming pool, but I thought I would share this regardless. This is actually a piece of art that gives the impression people are walking under water. This piece of art was created by Leandro Elrich and it is housed at the 21st Century Museum of Contemporary Art in Japan. How would you like to wake up every morning surrounded by water? 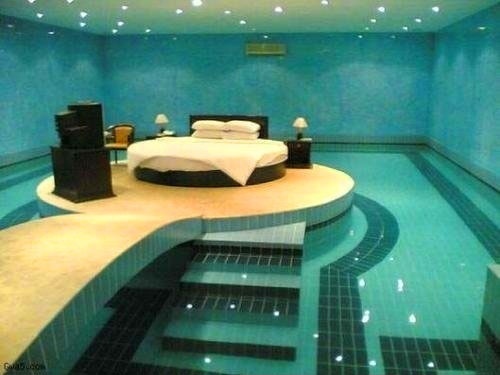 No, your water bed hasn’t exploded, instead you are sleeping in this calming room. I think I would quite like this, although I would be worried about having electrical gadgets in here. 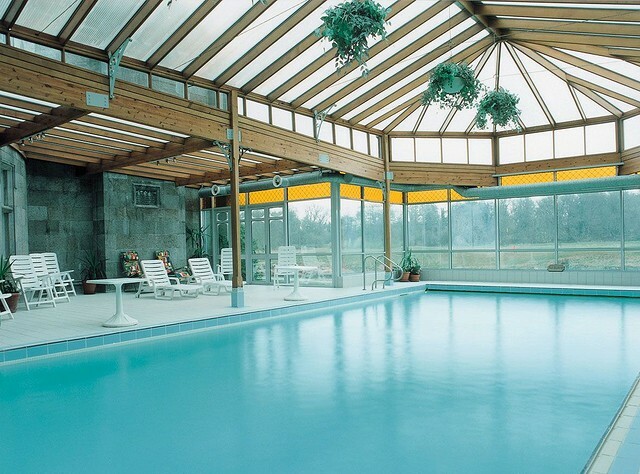 This is a lovely, large conservatory covering a shimmering blue pool. With a lovely view, this is the perfect room to host a pool party! I really like this swimming pool; it’s funky, relaxing and tranquil, although I could imagine setting up a DJ booth in the corner of the room and having some dance music playing, with cocktails flowing. Maybe P Diddy (the rapper) would do a music video here? This type of lighting would also look great in the parapet of an Anglian orangery! 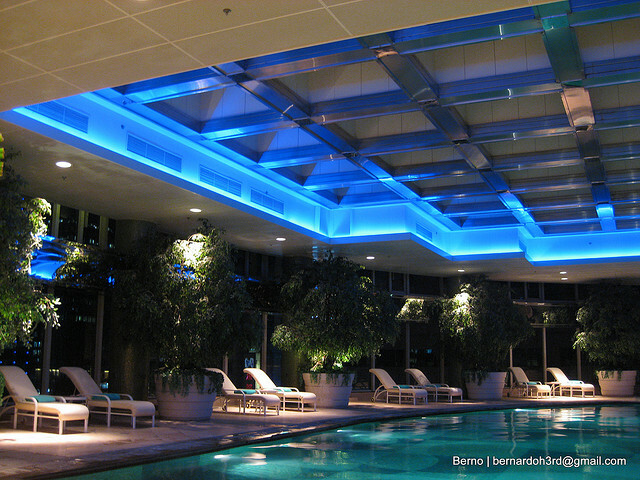 You can get lighting systems that change colour, so you could have every colour to suit your mood. This looks like the ultimate place for a pamper day. 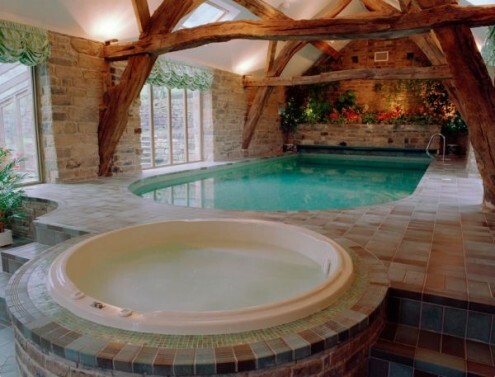 Jacuzzi, swimming pool, I reckon there are some massage beds hidden behind a wooden beam. 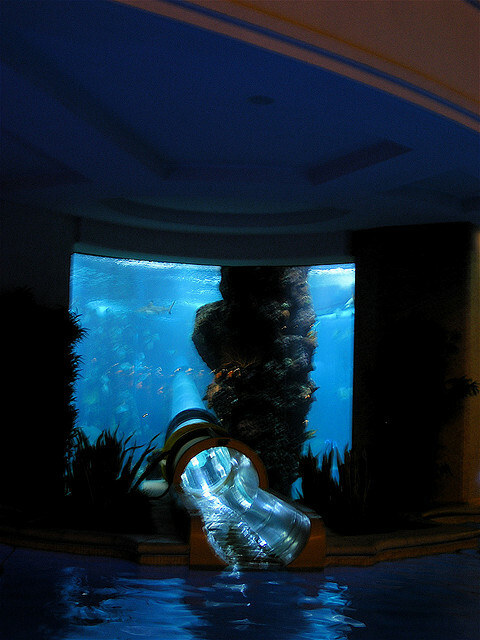 This is a water slide in a Las Vegas hotel, but it is no normal water slide as it travels through an aquarium that is filled with tropical fish, including sharks! Do not fear though as the sharks can’t get into the swimming pool….well I think so anyway. It’s not just humans that like a swim!